The collapse happened before noon on Friday. 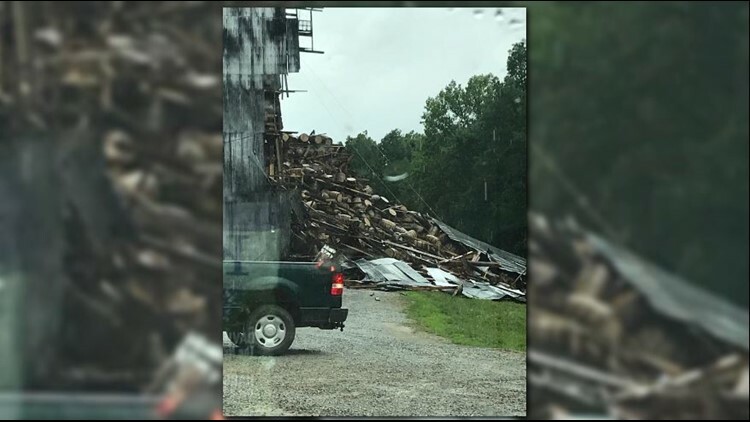 BARDSTOWN, Ky. (WHAS11) – A bourbon barrel warehouse partially collapsed in Bardstown, Ky. on June 22. The warehouse belongs to a company called Barton. The collapse was reported to dispatch at 10:55 a.m. on Friday. Milt Spalding, PIO for the Nelson County Emergency Management, said they do not know what caused the collapse. The collapse impacted around 9,000 barrels. According to Spalding the building houses about 20,000. The EPA is on the scene. Spalding said water samples in the area have been taken and all have come back clear. They are continuing to check the water at this time. "Right now we want to make sure that no alcohol got into the ground or water streams in that area," Spalding said. Engineers are working to secure the rest of the building and product. The building dates back to 1940, according to Bardstown Fire Chief Billy Mattingly. Barton is owned by the Sazerac Company which also owns Buffalo Trace in Frankfort, Ky.
Barton 1792 Distillery is confirming it did have an incident with one of its barrel warehouses, Warehouse #30 today, Friday, June 22nd around 11 a.m. EDT. One side of the barrel warehouse collapsed causing structural damage. No one was inside the warehouse and there were no injuries. The Distillery team took proactive measures to access and contain the damage immediately. The Kentucky Department for Environmental Protection has been on site and the Distillery team implemented a number of actions to minimize any environmental risk. Barrel Warehouse #30 was built in the 1940s and held approximately 18,000 barrels. We believe no more than half of the barrels inside are impacted; we are assessing how many of the impacted barrels can be recovered. A mix of various distilled products at various ages were stored in that warehouse. The Warehouse incident will not affect normal operations or tourism activities; the Distillery expects to be open for tours on Saturday and it will resume normal business operations on Monday. Barton 1792’s normal “summer shutdown,” which is when bourbon distilleries shut down for a short time period in the summer for repairs and routine maintenance, began last week. This will not affect bourbon production once the Distillery’s summer shutdown time period ends as already planned. It may be several days or weeks before a full assessment of the damage to Warehouse 30 at Barton 1792 is fully complete. At this time we do not know which Barton 1792 brands or customers will be impacted.